Putting in a little effort BEFORE you put your home on the market can help you get more money at closing. In this CWN video, Managing Editor Angie Moreschi shows us what preps pay off and which ones aren’t worth the time and money. Internet based identity theft can create serious problems if you get hacked and your information is sold on the dark web. Some companies are promoting dark web scans as a way to protect yourself, but do they really work? Consumer Warning Network Managing Editor Angie Moreschi checks out whether getting a dark web scan is really worth it and looks at other ways to protect yourself. Click below to see what she found out. Written by Angie Moreschi · Filed Under CWN, Featured | Comments Off on DO DARK WEB SCANS REALLY WORK? Tech savvy scammers are working hard to scam more consumers. Employment scams were the riskiest scams in 2018, according to the latest report from the Better Business Bureau. The reported employment scams had more instances and higher losses than in previous years when they ranked the third riskiest. The report is based on data supplied by consumers to BBB Scam Tracker and is based on the BBB Risk Index, which is a unique algorithm that calculates exposure, susceptibility, and monetary loss to offer a more accurate assessment of scam risk. The BBB says digging into the Risk Report shows one possible answer: Amazon was in the news a lot in 2018 with its high profile search for a second headquarters. It was also the 6th most impersonated organization mentioned in BBB Scam Tracker reports, after not even making the top 15 in previous years. In 2017, only 24 BBB Scam Tracker reports were employment scams that mentioned Amazon. In 2018, that jumped to 564. The Internal Revenue Service is the leading impersonated organization, and other government agencies together rank second. Other leading brands that scammers impersonate include Publishers Clearing House, Microsoft, Apple… and the Better Business Bureau. Amazon, a BBB Accredited Business, has only one authorized job application site: amazon.jobs. Any other link is a scam, said Trumpower. Click here to check out a report on the findings on CBS Morning News. To report a scam, go to BBB.org/ScamTracker. To learn more about different scam types, go to BBB.org/ScamTips. Written by Angie Moreschi · Filed Under CWN, Where's the Outrage? | Comments Off on The Riskiest Scams of 2018: Don’t be a Victim! At age 54, Igxie Rivera looks amazing, but no matter how much make-up she puts on, annoying under eye circles still bother her. “They make you look tired. I think my under eye doesn’t match with me,” Rivera said. Good drivers pay more for auto insurance if they rent, rather than own, their home, according to new research by the nonprofit Consumer Federation of America. The average increase in 10 states surveyed showed renters were charged 7 percent more for their premiums, an average of $112 a year. There’s no doubt scratch off lottery games are big business. 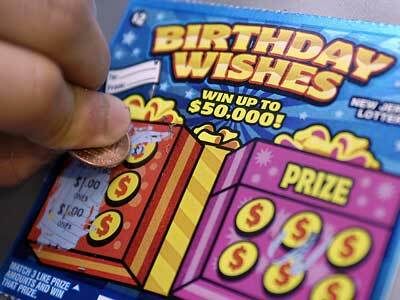 In 2013, the Florida Lottery sold more than $3 billion dollars in scratch off tickets. The top prizes often range from $5000 to several million. The urge to win big is often irresistible for folks going to fill up their tank at the gas station or pick up a gallon of milk at the grocery. “Winning money’s always fun!” laughed Melissa Rager, who says she loves the instant thrill of getting a winner. Does Writing “See ID” on Your Credit Card Protect You? We all need to take precautions these days to protect ourselves against identity theft, especially when it comes to your credit card. You may have heard that writing “See ID” on the back of your card, instead of signing it, is a way to protect yourself, because it encourages a cashier to check another form of identification. Well, Asa Aarons, with CreditCards.com, says not so fast. Click here to see his report on why writing “See ID” is not such a good idea. Written by Angie Moreschi · Filed Under CWN, Featured | Comments Off on Does Writing “See ID” on Your Credit Card Protect You? What’s the Best Way to Do Your Taxes? Written by Angie Moreschi · Filed Under CWN, Featured | Comments Off on What’s the Best Way to Do Your Taxes? It’s that time of year again, to let your loved one know just how special they are. So, with Valentine’s Day almost upon us, many of you are thinking of sending flowers, but don’t do it until you watch our “Flower Comparison” story. It shows you how the most popular flower vendors compare. Click here to watch. We’ve all had our share of cookies and chocolate over the holidays. Now it’s time to kick into gear your New Year’s resolution to get into shape. Whether you’re looking for a treadmill, elliptical or spinning bike, Consumer Reports put exercise machines to the test. Click here for a report by KDKA TV in Pittsburgh, on the best rated devices to help you slim down for 2014.